Microsoft today announced the general availability (GA) of the SharePoint Framework. 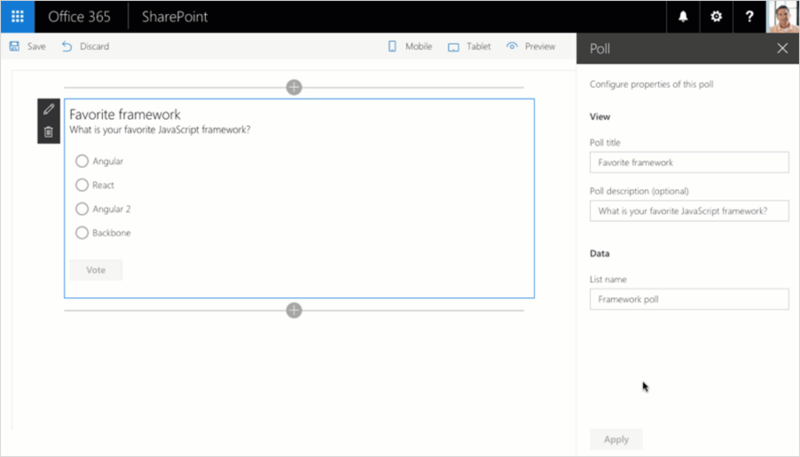 The SharePoint Framework is a page and web part model that provides full support for client-side SharePoint development, easy integration with SharePoint data and support for open source tooling. • AddIn365 maintain compatibility with Microsoft best practices, which delivers an optimal performance and future-proofing. • Organisations maximise the return on investment made in Office 365, by utilising the latest and greatest tools made available by Microsoft – quickly. AddIn365 have been building with the SharePoint Framework since November 2015, when we were engaged by the Microsoft Office 365 Product Group to input in to the planned framework. AddIn365 have contributed to design and interaction decisions, that Microsoft have today released. Working closely with Microsoft has allowed AddIn365 products to be GA ready. Once the Microsoft global roll-out is complete, expected in the next few weeks, AddIn365 customers will be able to light switch the new AddIn365 SharePoint Framework experience. It has been a privilege to work with the Product Group on the SharePoint Framework from the start and AddIn365 look forward to continuing the relationship.